As the weather cools, we turn to colour. This season we’re excited about the brights that are creeping in to our fashion palette, and turning up in our homes. We’re all about feeling cosy, and an outer layer is a great place for a bright splash of colour. A coat, wrap or even a bright raincoat is the perfect antidote to a grey day. If you’re worried about committing, choose a scarf, hat, gloves or lipstick and try on some colour. We bet you’ll be hooked. During the winter months we spend more time indoors, and it’s especially important to create an interior mood that’s both cosy, and positive. Whether you’re working from a monochrome or a neutral base, introducing some bold colour is a great way to energise your space. From February to June, the Persimmon fruit comes in to season, a burst of deep, orange flavour. Perfect for a winter coat, or a luxe long scarf. 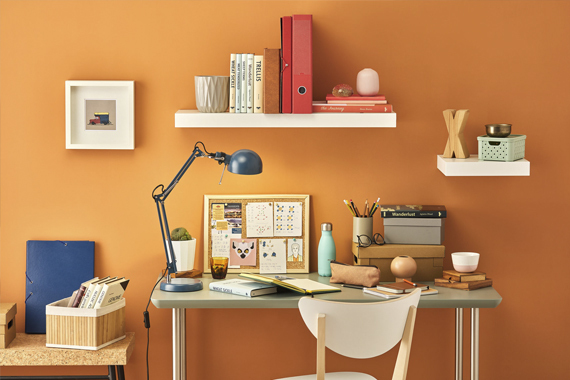 Take your Persimmon love a step further and embrace the depth that the colour brings to a home. Pair bright Persimmon-dipped chairs with a dark, or a natural wood, table. Try an orange bowl to serve a warm winter salad. If you’re really itching for a change, mix it up, and unleash a feature wall. 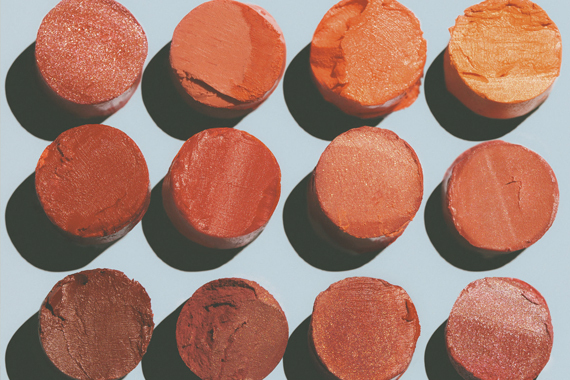 If you’re not quite ready to embrace the orange option, terracotta could be for you. A colour especially well suited to Australia, calling back to desert tones, it’s the perfect basis for a home rich in natural textures. Considering a renovation? Incorporating terracotta tiling will give you a look which will continue to evolve. Look for an unglazed natural finish. Phrases like ‘getting the blues’ or ‘the moody blues’ make us feel that the blues have been a little misunderstood. Break the rules and pair blue with black, and don’t forget to play with texture. Blues are a wonderful colour to bring indoors, with a huge range of shades that work perfectly together, offering rich options for contrast and texture. For a blue that’s at once fresh and timeless, dip in to shibori. A traditional Japanese dyeing technique, shibori cloth is folded, bunched, twisted or bound before being dipped into indigo. Consider using shibori cloth as a wall hanging, to create cushions, or as part of a table setting. If you’re looking for a break from the bolds, or looking to give some love to the quieter rooms in your house, switch to sherbet. Shades of pink and pistachio give a room fizz, without being overpowering. Perfect for light spaces, kids rooms, or smaller rooms that could be overwhelmed by bold colours. Sherbet shades are also a great way to break up the blacks in your casual clothes! A parka or light windbreaker looks great in a pastel shade, and if you’re really feeling it, opt for matching sneakers.